JR is a Jack Russell terrier with a nose for adventure. 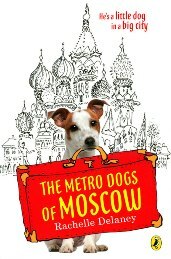 When he and his globe-trotting owner George are posted to the embassy in Moscow, JR joins a group of stray dogs who give him the city tour. George is unaware of JR’s friendships and unknowingly sets in motion a dog napping of huge proportion. Who is stealing the stray dogs? Cute, cunning, and criminal canines unite in this tale of a tail-wagging sleuth. The main character is a dog called J.R. This book is so good! I totally recommend it for all dog lovers!!! J.R.’s full name is Jack Russell. He is a little dog in a BIG City. J.R meets stray dogs in the book. This book is a very interesting.